The Diamond HK36 TTC Super Dimona is a two-seat single engine low-wing motor-glider. HOAC-Austria Flugzeugwerk began in 1989 with the development of the HK36 Super Dimona a two-seat powered glider made of fibre-reinforced high-tech composite based on the Hoffmann H36 Dimona. Series production of the HK36 Super Dimona began in 1990. 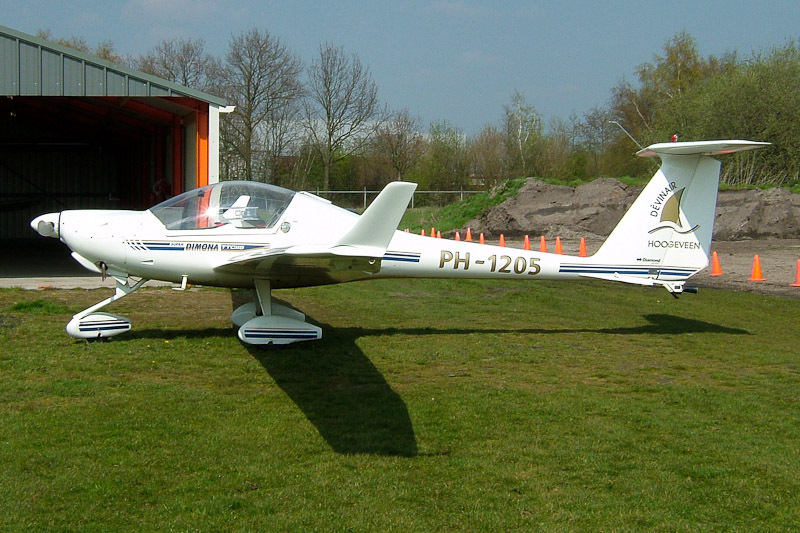 The Super Dimona is equipped with Rotax engines with either the 80 hp 912S; the 100 hp 912S or the 115 hp turbo-charged 914 variant and is commonly used for glider pilot training and towing. In 1996, the company was renamed into Diamond Aircraft Industries. In the USA and Canada, the Diamond HK36 TTC Super Dimona is known as Katana X-treme series. A surveillance derivate is the ECO Dimona, known as Multi Purpose Xtreme in Canada, which is equipped with a movable Wescam camera and cockpit monitor. Over 900 Super Dimona aircraft are built so far. Vliegclub Hoogeveen (VCH) operates 9 gliders. The towing of their gliders is done by the Super Dimona HK 36 TTC 115 motorgliders. One of the motor-gliders used is the Super Dimona HK36 TTC PH-1205, equipped for this task with special towing-equipment. The PH-1205 is powered by a Rotax 914 F3, 4 stroke turbo-charged engine, with a maximum take-off performance of 115 shp. Diamond HK 36 TTC c/n 36.676 was registered PH-1205 in the Netherlands on 26 June 2000. Until 20 April 2004, Diamond HK 36 TTC PH-1205 was operated bij Devinair. On 17 November 2009, registration PH-1205 was cancelled as exported to Germany, where the Diamond HK36 TTC Super Dimona was registered D-KTTC.